Centralized drilling systems with unique detachable centers. Available in Imperial sizes from 1/2" to 2-1/2" (and metric: 10 mm - 65 mm). Centering points and pilot drill bits have tapered shaft end for friction fit : 2.5 mm diameter for 1/2 to 2" (10-50 mm), and 3.5 mm, over 2" (51-65 mm) sizes. Bit and shank are in one piece. Shank sizes 9 mm, 12 mm and 16/12 mm, depending on bit size. Centering point included with sale of bit. Other centering devices available. Available in sizes from 1-1/2" to 3-3/4", (metric: 15 mm to 130 mm), up to 200 mm by special order. 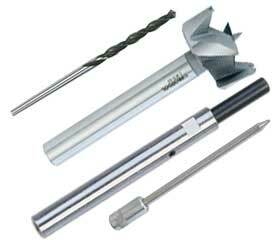 Centering points and pilot drill bits use normal parallel shaft ends and set screws to fasten. Shank sizes go from 9 mm, 12 mm, 20/13 mm to 30/16 mm. No centering point included with sale of bit; be sure to select the point, pilot drill bit bit, or guide pin you need. Zobo is a complete drilling system. It has no equal. It comes with a variety of centers: guide pins, centering points, pilot drill bits; and extensions. Lead in from one side, finish from the other. No burrs or tear-out whatsoever. Precise counter-sinking and enlarging of existing holes. Use freehand or in stationary, factory applications, furniture or timber processing. For every conceivable professional use and application: cabinet making, timber work, musical instruments, organ pipe making, composite stone (kitchen counter), laminates, stair making and more. System 2 from ½" to 2½"
System 3 from 1½" to 3¾"
Optional: Deep drilling system, up to 10 feet in a straight line or on angle. ZOBO bits can be resharpened up to 30 times. Swiss quality in materials and fabrication of bits. Hardened and precision milled and polished for long life and lasting cutting power. Chromium-plated for long service life. Hardened and machined drill bit shanks. Chrome-plated surface. Shank extensions available up to 15¾" (400 mm). Bits have internal thread so they attach very firmly and precisely to extensions. Zobo bits are made of premium quality material. High-alloy premium steel is processed then precisely machined, hardened and sharpened, thus ensuring quality cutting output and a long lifetime performance. Surfaces are chromium plated to reduce friction and heat buildup, and minimize burn marks in material. Thanks to the precise tapered pre-cutters and the main cutting edges of the bit, the surface finish of the drilled material is very smooth and without burrs. Drill holes for every desired diameter. From Imperial sizes 1/2" to 4", incremented by 1/16", or metric sizes 10 mm to 130 mm, every millimetre is available as standard. Special sizes up to an accuracy of 1/100 mm and diameters of 131-200 mm can be delivered upon request. "Gary, Just thought you would want to know that we used 4 Zobo bits along with the 1.25 pilot hole [using the 24" Holzmaster Doublecut Auger Bit] only sharpening each of them twice to drill +/- 2000 holes half of which were through 6" of Douglas fir the other half was through 22" douglas fir. We did all of this using only 1/2" Milwaukee magnum drills. We could not have used a better system. Thanks for your help. Chad"
Tungsten Carbide bits are only available in System 3.